Stunning Estate. This amazing estate will take your breath away. 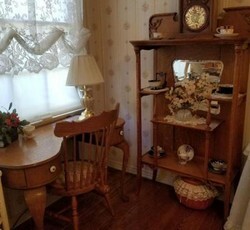 Decades of beautiful antique furnishings in mint condition in a beautiful cottage home. Canopy full bed, iron twin bed, queen Tempur Pedic bed, dressers, antiques armoires, secretaries, exquisite hand painted curio and entertainment pieces, sofas, chairs, buffets, desks, lawyers bookcases, entry table and mirror, dining table, coffee and end tables teacart, china sets, silver serving pieces, glassware, china sets, tea sets, linens, kitchen items galore, lots of cookwares, washer and dryer books galore, games and so much more. It's all here and in superior condition. Don't miss this special sale. © 2019 In Your Wildest Dreams Consignment & Antiques. Consignments and Antiques in Bakersfield CA.